The Mexican dwarf Lucia Zarate was unquestionably one of the tiniest women who ever lived. Born in 1864, her promoters claimed she was only 17 inches tall and weighed a mere five pounds. In other words, she was approximately the size of a small house cat. Many people didn't believe she was real, until she started to sing and dance before their eyes. Said to have been intelligent and charming, Lucia exhibited herself for several years and amassed quite an impressive fortune as one of the best paid performers of her day. Unfortunately, Lucia died on tour in 1890 when the train in which she was traveling became stalled in a mountain snowstorm. Zarate is said to have died of exposure. Another account claims she died of 'gastric fever', but no matter the cause death came early for Lucia Zarate. My desire to communicate Zarate's scale led me to place her within this composition borrowed from Goya's portrait of the young Manuel Osorio Manrique de Zuñiga. 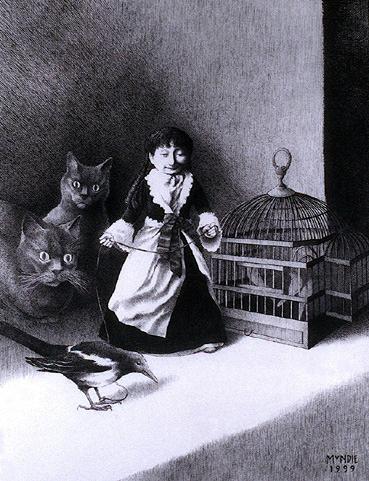 My own cats served as the models for the potentially dangerous felines behind the little lady.